A positive attitude causes a chain reaction of positive thoughts, events and outcomes. It is a catalyst… a spark that creates extraordinary results. 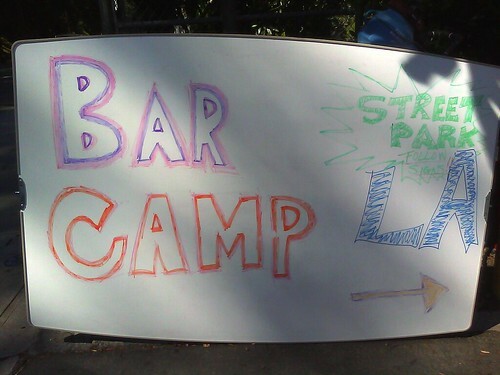 Last weekend I dropped by BarCampLA 8, held at Mt. Washington Elementary, in northeast LA county. The road leading to the elementary school was treacherous to say the least. The neighborhood I passed through had many windy roads twisting and intertwining up a mountain. Most streets were only wide enough for one-way traffic, though it flowed in both directions. There were a couple of points where it turned into a game of chicken around blind curves. I made it there safely and eventually made my way over to the session wall in the cafeteria. This is where participants posted their topics for their talks. Look at the variety. I sat in on a Kids Ruby talk which was really interesting. My computer wouldn’t load the software correctly for me to fully join in the coding exercises, but I watched the demo on the projector screen and absorbed enough info that way. After a bi bim bap burrito lunch from the yummy one food truck, I caught up with some friends and then attended a talk all about whiskey, in which I learned more than I ever thought I’d learn about whiskey without actually drinking it. Thanks, Bino G! 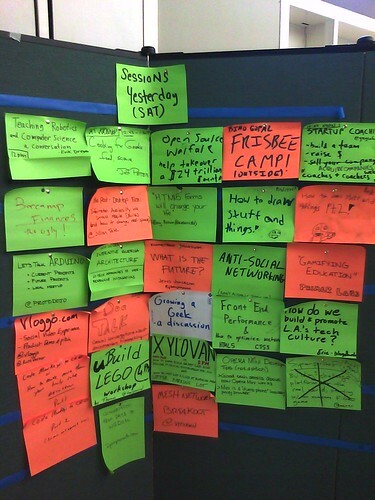 Next, I ran a session at 3pm and had a great group of attendees, all of whom contributed ideas and tips of their own. Hello, my name is Madeline and I’m more of a learning geek than fitness expert, but I’ve found some fun and effective ways to stay active in day-to-day life. And I enjoy encouraging others of all fitness abilities to do the same. I’m going to give you five great ways to get fit using technology. But first, let’s define what a good fitness goal is using the S.M.A.R.T. method. Once a S.M.A.R.T. goal is set then we can find ways that technology can help. Polled audience to find out whether they prefer to exercise in groups or alone. Most preferred group exercise. 1) Utilize metric devices. Solo exercisers can use a variety of tools (smartphones, wearable computers) and find training plans available on the web. Group exercisers can also use the web for training plans which they can print and also utilize each other for activities like pacing, being running buddies, and stretching partners. 2) Join online communities. Both exercise prefs can join online communities such as the active.com network to find out about events happening locally in just about any sport and train for ones of interest. 3) Attend group meet-ups. Meeting others who are interested in your method of fitness may keep you going a lot longer and stronger than doing it alone. Go to your favorite sporting goods store to find e-mail signup sheets or check their websites for local events or master classes. You can also find these by searching your favorite social networks by keyword. Good way to try out a new activity in a generally non-judgmental environment. dailymile – track workouts in multiple sports. RunKeeper – makes tracking your workouts fun, social, and easy to understand so that you can improve the quality of your fitness. SparkPeople – A diet and weight-loss online community. IronApp – The first app for iron athletes (via facebook). CardioTrainer – CardioTrainer is a free application for Android smartphones that lets you track and record all of your fitness activity. 5) Join a fitness group. Make consistent progress and new friends. These may be found on various social networks searchable by keyword or by asking around. Advantages (creates accountability, automatic record of progress, instant stats) and disadvantages (over reliance on gadgets, inaccuracies, metric site outages) of using technology.